Persistence of vision projects were once all the rage, judging by a quick review of the literature here on Hackaday. They’ve tapered off a bit lately, but this impressive full-color globe display might just kick-start some new POV projects. Built as a final project for an EE course, [Evan] and [Kyle]’s project is more about the control electronics and programming than the mechanical end of the build. Still, spinning a 12″ ring of 1/4″ thick acrylic with a strip of APA102 LEDs glued to the edge takes some thoughtful engineering. While the build appears sturdy, [Evan] does admit to a bit of wobble under full steam, which was addressed by adding some weight to the rig. We wonder if mounting half the LEDs on each side of the ring to balance the forces wouldn’t have worked better. True, it would have complicated the coding for the display, but maybe that would have been good for extra points. In any case, the display turned out well and the quality of the images is great. And as an aside: how awesome is it that we live at a time when you can order a six-circuit slip-ring for a project like this for less than $20? It’s the end of the semester and we love seeing the final projects that have just made it across the finish line. 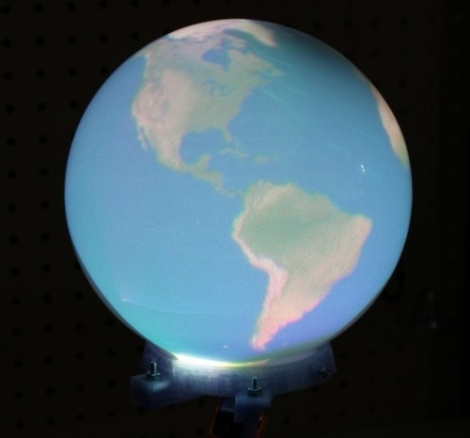 This globe is one, yesterday we saw a voice-controlled digital eye exam, and if you have or know of a final project, don’t forget send us the link! If POV globes are your thing, be sure to set the Hackaday WABAC machine a few years and check out this Death Star design from 2012 or this globe from 2010. Metal fabrication is a an art that often goes under appreciated. The ability to take common stock in the form of sheet, pipe (square or round), and in this case rod, and make it into anything is intoxicating for the artist and super villain inside of each of us. Recently [asciiArtVandaly] took on an interesting job and was thoughtful enough to make a photo album of the process. He literally created the world out of metal. The build is a wire-frame globe. The latitude and longitude rods are rolled to the proper arc, but holding them in place is a bit of a trick. This image shows the welding jig built just for this project. It has large and small nobs to match the increasing spacing of the rods, with washers holding down ever other joint. If you want to see an example of rod-rolling check out the unrelated How It’s Made segment found after the break. This jig is visually stunning to look at, but the math used to lay something like this out is only mildly interesting compared to the work done to add the continents to the piece. Each of these were cut out and then hand hammered to match the curve of the globe before being welded in place and outfitted with lighting for cities. That’s a skill you can’t get without a lot of practice — and get this, [asciiArtVandalay] does it as a hobby. Who knew robot engineers needed hobbies? The finished globe is about eighty pounds of stainless steel. The build ends up being corporate art for a company sure to turn [Tyler Durden’s] eye. [Nirav] liked the idea of having his own personal Earth at the tip of his fingers, and since that’s not happening any time soon, he decided to build the next best thing. Sure, he could have simply gone out and purchased a globe, but there is no fun in that. Instead, he shows us how he put together an interactive spherical display that won’t break the bank. The sphere uses a Microvision SHOWWX to drive its display, which projects an image inside of a frosted glass light fixture. The pico projector gets some help from a 180° fisheye lens along the way, enabling the picture to be stretched across the entire inner surface of the globe. [Nirav] used his 3D extruder to build a base for the globe, which attaches to the projector via a printed mounting plate. A GorillaPod was used to keep things upright while he dusted off his trigonometry skills in order to figure out how to get the image just right. We think that he did a great job – it definitely looks to be on par (albeit a bit smaller) than the eye of Sauron globe we saw a while back. We can’t wait to see a video of this thing in action once it’s completely finished!